Must my mover write up an order for service? We require your mover to prepare an order for service on every shipment transported for you. You are entitled to a copy of the order for service when your mover prepares it. The order for service is not a contract. Should you cancel or delay your move, or if you decide not to use the mover, you should promptly cancel the order. If you or your mover change any agreed upon dates for pickup or delivery of your shipment, or agree to any change in the non-binding estimate, your mover may prepare a written change to the order for service. The written change must be attached to the order for service. Your mover’s name and address and the U.S. DOT number assigned to your mover. Your name, address and, if available, telephone number(s). The name, address, and telephone number of the delivering mover’s office or agent at or nearest to the destination of your shipment. A telephone number where you may contact your mover or its designated agent. One of the following three dates and times: a. The agreed-upon pickup date and agreed delivery date of your move. b. The agreed-upon period(s) of the entire move. c. If your mover is transporting the shipment on a guaranteed service basis, the guaranteed dates or periods of time for pickup, transportation, and delivery. Your mover must enter any penalty or per diem requirements upon the agreement under this item. The names and addresses of any other motor carriers, when known, that will participate in interline transportation of the shipment. The form of payment your mover will honor at delivery. The payment information must be the same as was entered on the estimate. The terms and conditions for payment of the total charges, including notice of any minimum charges. The maximum amount your mover will demand, based on the mover’s estimate, at the time of delivery to obtain possession of the shipment, when transported on a collect-on-delivery basis. If not provided in the bill of lading, the Surface Transportation Board’s required released rates valuation statement, and the charges, if any, for optional valuation coverage. The Surface Transportation Board’s required released rates may be increased annually by your mover based on the U.S. Department of Commerce’s Cost of Living Adjustment. A complete description of any special or accessorial services ordered and minimum weight or volume charges applicable to the shipment. Any identification or registration number your mover assigns to the shipment. For non-binding estimated charges, your mover’s reasonably accurate estimate of the amount of the charges, the method of payment of total charges, and the maximum amount (110 percent of the non-binding estimate) your mover will demand at the time of delivery for you to obtain possession of the shipment. For binding estimated charges, the amount of charges your mover will demand based upon the binding estimate and the terms of payment under the estimate. An indication of whether you request notification of the charges before delivery. You must provide your mover with the telephone number(s) or address(es) where your mover will transmit such communications. You and your mover must sign the order for service. Your mover must provide a dated copy of the order for service to you at the time your mover signs the order. Your mover must provide you the opportunity to rescind the order for service without any penalty for a three-day period after you sign the order for service, if you scheduled the shipment to be loaded more than three days after you sign the order. Your mover should provide you with documents that are as complete as possible, and with all charges clearly identified. However, as a practical matter, your mover usually cannot give you a complete bill of lading before transporting your goods. This is both because the shipment cannot be weighed until it is in transit and because other charges for service, such as unpacking, storage-in-transit, and various destination charges, cannot be determined until the shipment reaches its destination. Therefore, your mover can require you to sign a partially complete bill of lading if it contains all relevant information except the actual shipment weight and any other information necessary to determine the final charges for all services provided. Signing the bill of lading allows you to choose the valuation option, request special services, and/or acknowledge the terms and conditions of released valuation. Your mover also may provide you, strictly for informational purposes, with blank or incomplete documents pertaining to the move. Before loading your shipment, and upon mutual agreement of both you and your mover, your mover may amend an order for service. Your mover must retain an order for service for a shipment it transported for at least one year from the date your mover wrote the order. Your mover must inform you, before or at the time of loading, if the mover reasonably expects a special or accessorial service is necessary to transport a shipment safely. Your mover must refuse to accept the shipment when your mover reasonably expects a special or accessorial service is necessary to transport a shipment safely, but you refuse to purchase the special or accessorial service. Your mover must make a written note if you refuse any special or accessorial services that your mover reasonably expects to be necessary. Must my mover write up an inventory of the shipment? Yes. Your mover must prepare an inventory of your shipment before or at the time of loading. If your mover’s driver fails to prepare an inventory, you should write a detailed inventory of your shipment listing any damage or unusual wear to any items. The purpose is to make a record of the existence and condition of each item. After completing the inventory, you should sign each page and ask the mover’s driver to sign each page. Before you sign it, it is important you make sure that the inventory lists every item in the shipment and that the entries regarding the condition of each item are correct. You have the right to note any disagreement. If an item is missing or damaged when your mover delivers the shipment, your subsequent ability to dispute the items lost or damaged may depend upon your notations. You should retain a copy of the inventory. Your mover may keep the original if the driver prepared it. If your mover’s driver completed an inventory, the mover must attach the complete inventory to the bill of lading as an integral part of the bill of lading. Must my mover write up a bill of lading? The bill of lading is the contract between you and the mover. The mover is required by law to prepare a bill of lading for every shipment it transports. The information on a bill of lading is required to be the same information shown on the order for service. The driver who loads your shipment must give you a copy of the bill of lading before or at the time of loading your furniture and other household goods. It is your responsibility to read the bill of lading before you accept it. It is your responsibility to understand the bill of lading before you sign it. If you do not agree with something on the bill of lading, do not sign it until you are satisfied it is correct. The bill of lading requires the mover to provide the service you have requested. You must pay the charges set forth in the bill of lading. The bill of lading is an important document. Do not lose or misplace your copy. Have it available until your shipment is delivered, all charges are paid, and all claims, if any, are settled. Your mover’s name and address, or the name and address of the motor carrier issuing the bill of lading. The names and addresses of any other motor carriers, when known, who will participate in the transportation of the shipment. The name, address, and telephone number of the office of the motor carrier you must contact in relation to the transportation of the shipment. The form of payment your mover will honor at delivery. The payment information must be the same that was entered on the estimate and order for service. When your mover transports your shipment under a collect-on-delivery basis, your name, address, and telephone number where the mover will notify you about the charges. For non-guaranteed service, the agreed-upon date or period of time for pickup of the shipment and the agreed-upon date or period of time for the delivery of the shipment. The agreed-upon dates or periods for pickup and delivery entered upon the bill of lading must conform to the agreed-upon dates or periods of time for pickup and delivery entered upon the order for service or a proper amendment to the order for service. For guaranteed service, the dates for pickup and delivery and any penalty or per diem entitlements due you under the agreement. The actual date of pickup. The identification number(s) of the vehicle(s) in which your mover loads your shipment. The terms and conditions for payment of the total charges including notice of any minimum charges. The maximum amount your mover will demand from you, based on the mover’s estimate, at the time of delivery for you to obtain possession of your shipment, when your mover transports under a collect-on-delivery basis. If not provided for in the order for service, the Surface Transportation Board’s required released rates valuation statement, and the charges, if any, for optional valuation coverage. The Board’s required released rates may be increased annually by your mover based on the U.S. Department of Commerce’s Cost of Living Adjustment. Evidence of any insurance coverage sold to or procured for you from an independent insurer, including the amount of the premium for such insurance. Each attachment to the bill of lading. Each attachment is an integral part of the bill of lading contract. If not provided to you elsewhere by the mover, the following three items must be added as attachments: a. The binding or non-binding estimate. b. The order for service. c. The inventory. A copy of the bill of lading must accompany your shipment at all times while in the possession of your mover or its agent(s). When your mover loads the shipment on a vehicle for transportation, the bill of lading must be in the possession of the driver responsible for the shipment. Your mover must retain bills of lading for shipments it transported for at least one year from the date your mover created the bill of lading. Should I reach an agreement with my mover about pickup and delivery times? You and your mover should reach an agreement for pickup and delivery times. It is your responsibility to determine on what date, or between what dates, you need to have the shipment picked up and on what date, or between what dates, you require delivery. It is your mover’s responsibility to tell you if it can provide service on, or between, those dates, or, if not, on what other dates it can provide the service. In the process of reaching an agreement with your mover, you may find it necessary to alter your moving and travel plans if no mover can provide service on the specific dates you desire. Do not agree to have your shipment picked up or delivered ”as soon as possible. ” The dates or periods you and your mover agree upon should be definite. Once an agreement is reached, your mover must enter those dates upon the order for service and the bill of lading. Once your goods are loaded, your mover is contractually bound to provide the service described in the bill of lading. Your mover’s only defense for not providing the service on the dates called for is the defense of force majeure. This is a legal term. It means that when circumstances change, were not foreseen, and are beyond the control of your mover, preventing your mover from performing the service agreed to in the bill of lading, your mover is not responsible for damages resulting from its nonperformance. This may occur when you do not inform your mover of the exact delivery requirements. For example, because of restrictions trucks must follow at your new location, the mover may not be able to take its truck down the street of your residence and may need to shuttle the shipment using another type of vehicle. Must my mover determine the weight of my shipment? Generally, yes. If your mover transports your household goods on a non-binding estimate, your mover must determine the actual weight of the shipment in order to calculate its lawful tariff charge. If your mover provided a binding estimate and has loaded your shipment without claiming you have added additional items or services, the weight of the shipment will not affect the charges you will pay. Your mover must determine the weight of your shipment before requesting you to pay for any charges dependent upon your shipment’s weight. Most movers have a minimum weight charge for transporting a shipment. Generally, the minimum is the charge for transporting a shipment of at least 3,000 pounds (1,362 kilograms). If your shipment appears to weigh less than the mover’s minimum weight, your mover must advise you on the order for service of the minimum cost before transporting your shipment. Should your mover fail to advise you of the minimum charges and your shipment is less than the minimum weight, your mover must base your final charges upon the actual weight, not upon the minimum weight. How must my mover determine the weight of my shipment? Your mover must weigh your shipment upon a certified scale. The weight of your shipment must be obtained by using one of two methods—origin weighing or destination weighing. Origin Weighing—Your mover may weigh your shipment in the city or area where it loads your shipment. If it elects this option, the driver must weigh the truck before coming to your residence. This is called the tare weight. At the time of this first weighing, the truck may already be partially loaded with another shipment(s). This will not affect the weight of your shipment. The truck should also contain the pads, dollies, hand trucks, ramps, and other equipment normally used in the transportation of household goods shipments. After loading, the driver will weigh the truck again to obtain the loaded weight, called the gross weight. The net weight of your shipment is then obtained by subtracting the tare weight before loading from the gross weight. Destination Weighing (Also called Back Weighing) – The mover is also permitted to determine the weight of your shipment at the destination after it delivers your load. Weighing your shipment at destination instead of at origin will not affect the accuracy of the shipment weight. The most important difference is that your mover will not determine the exact charges on your shipment before it is unloaded. Destination weighing is done in reverse of origin weighing. After arriving in the city or area where you are moving, the driver will weigh the truck. Your shipment will still be on the truck. Your mover will determine the gross weight before coming to your new residence to unload. After unloading your shipment, the driver will again weigh the truck to obtain the tare weight. The net weight of your shipment will then be obtained by subtracting the tare weight after delivery from the gross weight. At the time of both weighings, your mover’s truck must have installed or loaded all pads, dollies, hand trucks, ramps, and other equipment normally required in the transportation of your shipment. The driver and other persons must be off the vehicle at the time of both weighings. The fuel tanks on the vehicle must be full at the time of each weighing. In lieu of this requirement, your mover must not add fuel between the two weighings when the tare weighing is the first weighing performed. Your mover may detach the trailer of a tractor-trailer vehicle combination from the tractor and have the trailer weighed separately at each weighing provided the length of the scale platform is adequate to accommodate and support the entire trailer. Your mover may use an alternative method to weigh your shipment if it weighs 3,000 pounds (1,362 kilograms) or less. The only alternative method allowed is weighing the shipment upon a platform or warehouse certified scale before loading your shipment for transportation or after unloading. Your mover must use the net weight of shipments transported in large containers such as ocean or railroad containers. Your mover will calculate the difference between the tare weight of the container (including all pads, blocking and bracing used in the transportation of your shipment) and the gross weight of the container with your shipment loaded in the container. You have the right, and your mover must inform you of your right, to observe all weighings of your shipment. Your mover must tell you where and when each weighing will occur. Your mover must give you a reasonable opportunity to be present to observe the weighings. You may waive your right to observe any weighing or re-weighing. This does not affect any of your other rights under Federal law. Your mover may request you waive your right to have a shipment weighed upon a certified scale. Your mover may want to weigh the shipment upon a trailer’s on-board, non-certified scale. You should demand your right to have a certified scale used. The use of a non-certified scale may cause you to pay a higher final bill for your move, if the non-certified scale does not accurately weigh your shipment. Remember that certified scales are inspected and approved for accuracy by a government inspection or licensing agency. Non-certified scales are not inspected and approved for accuracy by a government inspection or licensing agency. The complete name and location of the scale. The date of each weighing. Identification of the weight entries as being the tare, gross, or net weights. The company or mover identification of the vehicle. Your last name as it appears on the bill of lading. Your mover’s shipment registration or bill of lading number. Your mover must retain the original weight ticket or tickets relating to the determination of the weight of your shipment as part of its file on your shipment. When both weighings are performed on the same scale, one weight ticket may be used to record both weighings. Your mover must present all freight bills with true copies of all weight tickets. If your mover does not present its freight bill with all weight tickets, your mover is in violation of Federal law. Before the driver actually begins unloading your shipment weighed at origin and after your mover informs you of the billing weight and total charges, you have the right to demand a re-weigh of your shipment. If you believe the weight is not accurate, you have the right to request your mover re-weigh your shipment before unloading. You have the right, and your mover must inform you of your right, to observe all re-weighings of your shipment. Your mover must tell you where and when each re-weighing will occur. Your mover must give you a reasonable opportunity to be present to observe the re-weighings. You may waive your right to observe any re-weighing; however, you must waive that right in writing. You may send the written waiver via fax or e-mail, as well as by overnight courier or certified mail, return receipt requested. This does not affect any of your other rights under Federal law. Your mover is prohibited from charging you for the re-weighing. If the weight of your shipment at the time of the re-weigh is different from the weight determined at origin, your mover must re-compute the charges based upon the re-weigh weight. Count the number of items in your shipment. Usually there will be either 30 or 40 items listed on each page of the inventory. For example, if there are 30 items per page and your inventory consists of four complete pages and a fifth page with 15 items listed, the total number of items will be 135. If an automobile is listed on the inventory, do not include this item in the count of the total items. Subtract the weight of any automobile included in your shipment from the total weight of the shipment. If the automobile was not weighed separately, its weight can be found on its title or license receipt. Divide the number of items in your shipment into the weight. If the average weight resulting from this exercise ranges between 35 and 45 pounds (16 and 20 kilograms) per article, it is unlikely a re-weigh will prove beneficial to you. In fact, it could result in your paying higher charges. Experience has shown that the average shipment of household goods will weigh about 40 pounds (18 kilograms) per item. If a shipment contains a large number of heavy items, such as cartons of books, boxes of tools or heavier than average furniture, the average weight per item may be 45 pounds or more (20 kilograms or more). What must my mover do if I want to know the actual weight or charges for my shipment before delivery? If you request notification of the actual weight and charges of your shipment, your mover must comply with your request if it is moving your goods on a collect-on-delivery basis. This requirement is conditioned upon your supplying your mover with an address or telephone number where you will receive the communication. Your mover must make its notification by telephone, fax transmissions, e-mail, overnight courier, certified mail with return receipt requested, or in person. You must receive the mover’s notification at least one full 24-hour day before its scheduled delivery, excluding Saturdays, Sundays, and Federal holidays. Back-weigh (when your mover weighs your shipment at its destination). Pickup and delivery encompassing two consecutive weekdays, if you agree. Maximum payment amounts at time of delivery of 110 percent of the estimated charges, if you agree. I had to move unexpectedly mid-semester and didn't want to deal with days of moving so I hired movers for the first time ever and I'm so happy I did! These guys showed up on time, which was much appreciated since I was trying to squeeze a move in after a full day of clinicals. It started hailing about five minutes after they showed up AND I was moving from one 3rd-floor apartment to another 3rd-floor apartment across the parking lot. They carried all my things (a whole bedroom, a dining table, and some living room stuff) over to the new apartment and finished in just two hours! They made it look easy and were done with enough time for me to study after they left. It was the most painless and easy move! The foreman Serafin was communicative and his two guys were very efficient (I believe one of their names was Rogelio). So happy I chose Triple 7! We built a home in Mesquite, NV. After having lived in Las Vegas for 40 years we just wanted to get away from it all. But since we are getting older we decided a long (80 miles) move like this would require just a little more than a rental truck and some "friends" off the street to help. 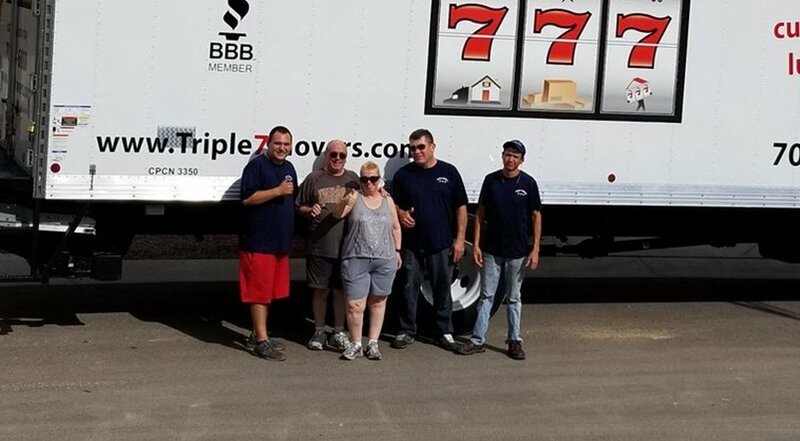 So we were lucky enough to find Triple 7 Movers. 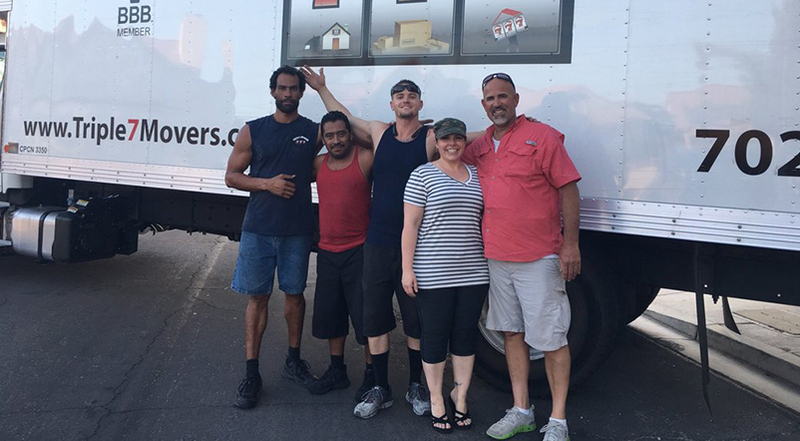 From the original order process with Jason to Norberto and his team being right on time this move was the easiest we have ever had (we've moved 12 times over the years!). The team was quick, friendly and to top it all off, they were so fast and efficient the final price was nearly $120 less than Jason's original quote!!! We are very grateful guys. Thanks. I really hate moving and decided to move into a new apartment. I waited until the last minute to pack etc... Well, Jason Blaine was very very accommodating in scheduling and was on top of gaining my trust, then business. So today was moving day... ugh!!! But if it were not for the team of Israel, Jose L. And Steven, my daughter and I would not have gotten it done. They worked so fast and efficient for how disorganized we were. I would highly recommend them for your move. The rate was very fair and I had them go out of their way for garbage runs. Can't say how happy I am that I got these 3 for our move! Definitely a great choice!!! Thanks Jason! Thanks Israel, Jose, and Steven! 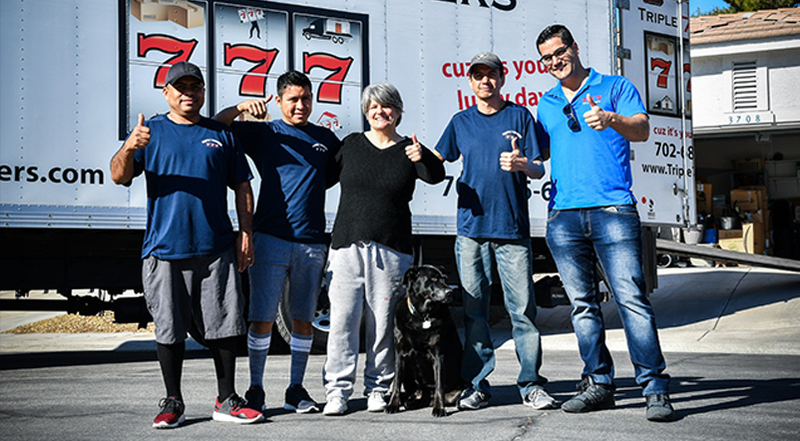 Triple 7 Movers is a family-owned and operated moving company in Las Vegas.